Is there nothing Father Christmas cannot do? 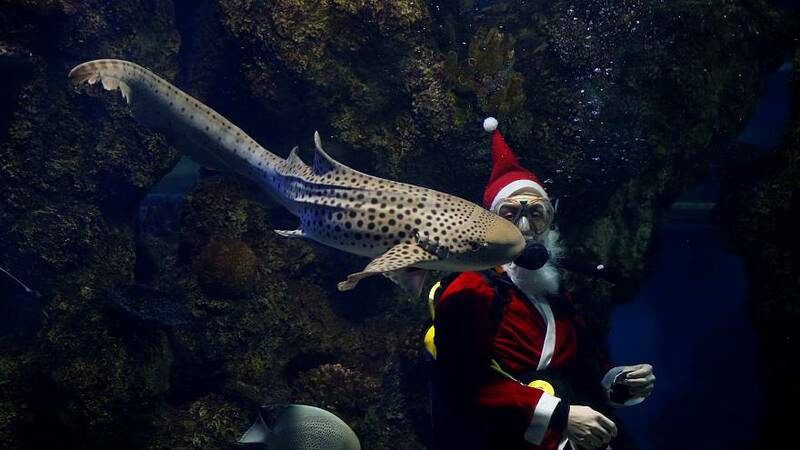 Even without the use of a chimney, Santa popped into a huge fish tank in Malta's National Aquarium in Qawra on Wednesday to hand out treats to sharks and fish - but only those who had been well behaved throughout the year. Santa's 'Ho, ho, ho' came out in bubble form through his breathing apparatus that he wore over his usual red suit. He even had time to stop and stroke the tummy of a zebra shark who was clearly on his best behaviour. Father Christmas didn't hand out any presents though - the aquarium fish will just have to wait until Christmas Day like everyone else.